This is the third of a three-part series about the different trail areas covered in the second edition of the Uwharrie Lakes Region Trail Guide. Morrow Mountain State Park is located along the west shore of Lake Tillery, where the Yadkin River and the Uwharrie River meet and become the Pee Dee River. 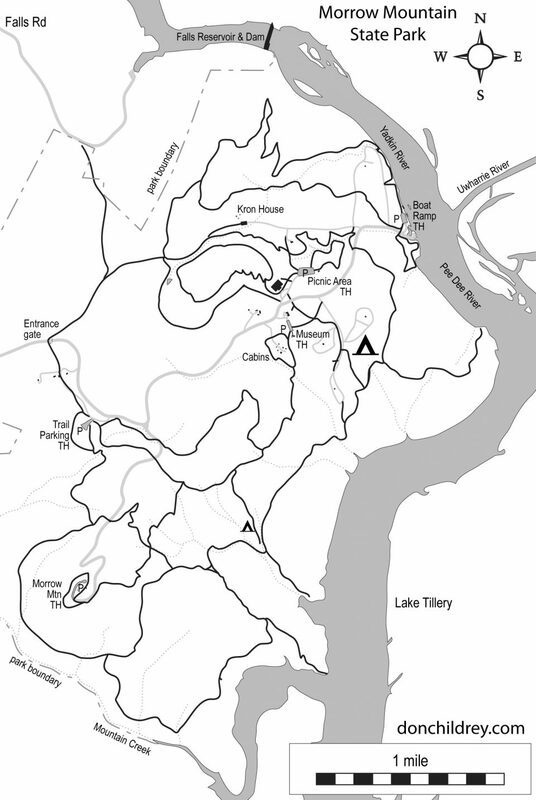 Morrow Mountain State Park contains more than 37 miles of hiking trails. About 20 miles are open to equestrian use. Bicycles are not allowed on the trails, but the paved park road that climbs to the summit of Morrow Mountain is popular with road cyclists. The park offers rental cabins, a campground, group campsites, and a few backpack-in campsites. In addition to a boat ramp, canoe rentals, and a pool, a small museum and several history exhibits round out the many points of interest in the park. The City of Albemarle and its numerous stores and restaurants are less than 5 miles from the park. Trails at Morrow Mountain vary from level, sandy stretches along the lakeshore to a steep climb up the park’s namesake mountain. Several of the other mountains in the park are traversed by trails, providing the visitor with a chance to see a wide variety of environments. NC Zoo Park is a new addition to the guide. The paved pathways through the NC Zoo exhibits offer a fair bit of walking mileage, but the Zoo is also developing a set of more traditional trails outside of the exhibit areas. Their trail offerings are still limited, only totaling five miles in 2014, but work to extend them continues. Access to these trails does not require a Zoo admission ticket. The trails maintained by the Zoo are not all located at the main Zoo property. The Ridges Mountain property is home to some fascinating rock outcroppings. The Pisgah Covered Bridge property is a small park with historical significance and a short loop trail that showcases the creekside environment near the bridge. Uwharrie Trail area is a corridor that runs through several of the areas described elsewhere – the Birkhead Mountains Wilderness, Morris Mountain, and Wood Run. A few other areas connect these larger sections into a corridor nearly 40 miles long. The Uwharrie Trail runs through it all, offering hikers the opportunity for fairly long-distance trips. 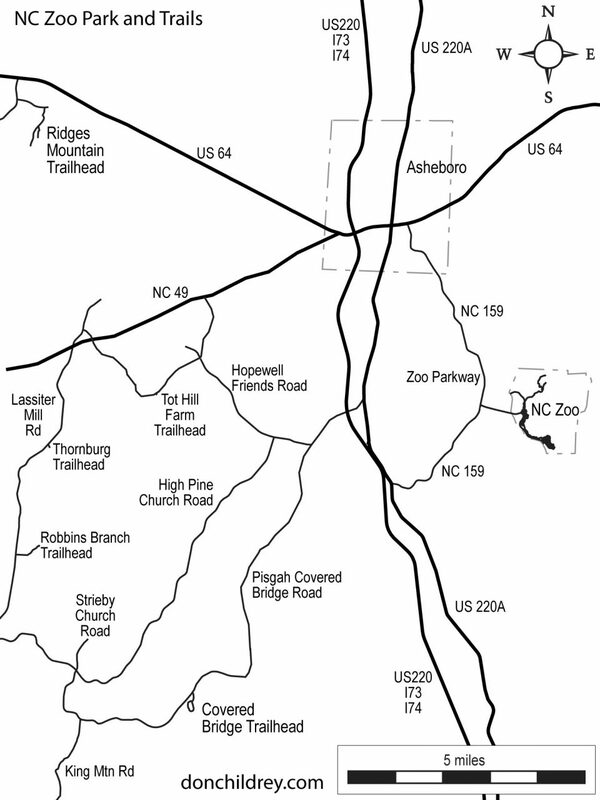 Even though some of these areas are covered in other chapters in the book, the Uwharrie Trail section focuses on this one trail and presents data in a way most helpful for anyone hiking through on part or all of the Uwharrie Trail. 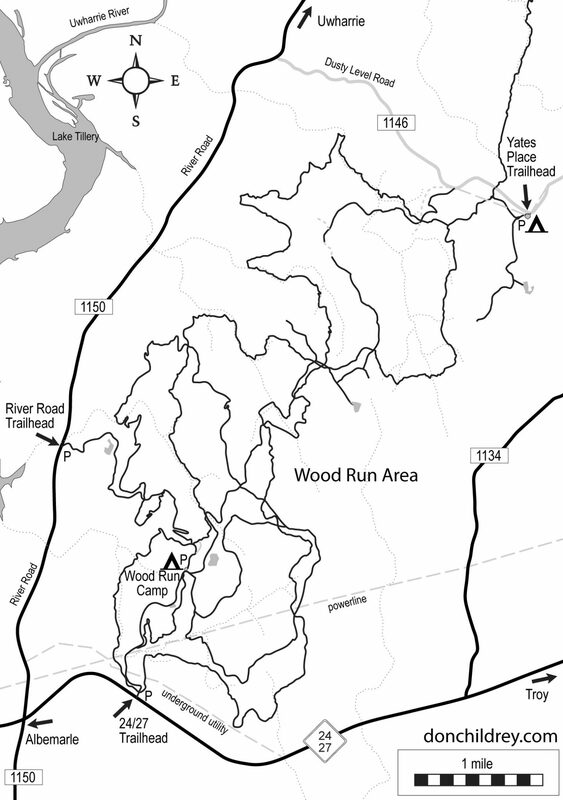 Wood Run Area is home to the southern end of the Uwharrie Trail and the Wood Run Mountain Bike Trail system. The bike trails and bikeable forest roads offer mountain bikers nearly 20 miles of backcountry fun to explore. Several miles of the Keyauwee Trail were rebuilt specifically to flow better for biking. 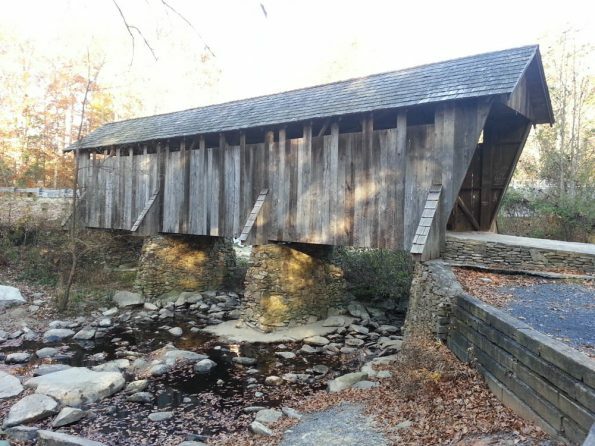 The popular figure-eight route formed by the Uwharrie and Dutchman’s Creek trails offers hikers and backpackers a convenient 20-mile loop. The numerous trails in the Wood Run Area can be combined to create hiking route loops from just a couple of miles long to forty miles or more. Many of these trip route possibilities are covered in the guide, with maps and mileages details provided.